All Malayalees are familiar with the name chundan vallams or snake boats. The English term of chundan vallam is snake boat. They are called so due to their eel like structures. Usually these snake boats or chundan vallams are associated with onam celebrations in the form of vallam kali. 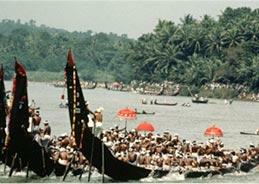 It should be noted that vallam kali is the popular term used in Kerala, but it is also known as snake boat races. I know most people are fond of snake boats. Tourists from different parts of the world are attracted to Kerala or God's own country during Onam festivals inorder to see these snake boat races. So remember that snake boats or chundan vallams are having world wide recognitions. The architecture of these snake boats is an important fact which attracts majority of the people. Due to its structure, these snake boats are popularly known as the beaked boats. It should be noted that Kodupunna Venkitanarayanan Asari was the first person to design a chundan vallam. In the world these chundan vallams are considered as examples of largest human powered boats. 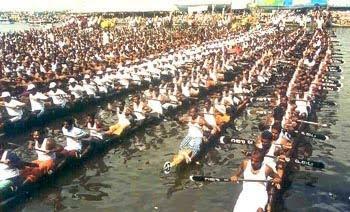 About 100 oarsmen can be accommodated in a single chundan vallam. The following are considered as some of the famous chundan valllams that are used in the world. From the points mentioned above, you may be able to understand the names of some famous chundan vallams that are popular in Kerala. Apart from these points, you must also know something about Aries Chundan. It's interesting to note that Aries Chundan have an important place in the Guiness Book of World Records. So remember that this chundan is having some specialities. I know now you are in a curiosity to know about the special feature of this Aries Chundan. Aries chundan is a 143.25 foot long steel snake boat that can carry 141 people including 5 helmsmen & 136 rowers & it is considered as the largest canoe crew in the world. I think now you got an idea regarding Aries chundan that it is not a simple chundan, but having the Limca book of records for being the longest steel snake boat. This chundan was created by the Aries Marine & Engineering Services, Dubai. Almost all people of the world are interested in seeing snake boats. But most often we donot think much about the creation of a chundan vallam. The world famous 'AUTOSHIP' software was used for designing the shape & stability of Aries chundan. Another important fact regarding Aries chundan was that it was first used in the Nehru Trophy Boat Race of 2008 that was held at Punnamada Lake of Alappuzha district of Kerala state, India. But for the first time only women crew were boarded in it. Experts with their hardwork were the success of Aries chundan that is having 8 tonnes weight, 143.25 feet length & 5.74 feet beadth. Usually snake boats are made of wood & so note that important feature of Aries chundan (manufactured by steel). We all know a common fact that each & everything present in the world is associated with a legend & history. 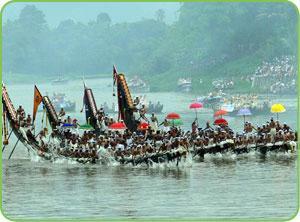 Majority of the people present in the world may have a curiosity to know the history & legend behind the snake boats. During onam celebrations snake boat races are considered as important events in our Kerala culture. 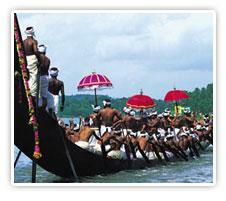 Tourists are attracted to our country mainly due to this snake boat races associated with Onam celebrations. That means during onam festival, tourism is gaining popularity. So before watching the snake boat races, remember there is a legend as well as history related to this snake boat. A Brahmin was offering his daily prayers & inorder to complete the rituals he was waiting to feed a poor man. After completing his prayers, he opened his eyes & was surprised to see a boy standing before him. The Brahmin, who wanted to complete his rituals, gave a bath to the boy, meal & a new set of clothes. But after having the meal, the boy disappeared. Atlast the Brahmin spotted the boy at the Aranmula temple but again he disappeared. So the Brahmin came to a conclusion that it was God himself who came infront of him. After that event, every year during the Onam season, the Brahmin began to bring food to the famous Aranmula temple. To ensure protection, they are accompanied by snake boats. From that onwards, this tradition gained popularity & now the snake boat race is a grand carnival in our state. That means they are the centre of attractions in boat races held during onam festivals of Kerala. Now you may be thinking about the secrets behind the building of a snake boat. An ancient scripture defining the building of wooden boats is simply known as the Sthap Athya Veda. So remember that every detail regarding the construction of a snake boat is revealed in the Sthap Athya Veda. Making a snake boat is not an easy task. We are just enjoying the beauty of these boats during the races. But on the otherhand we should be aware about the hardwork of people who made these snake boats. It's amazing to note that for making a single snake boat, 650 man days are taken. About 83 feet length & 6 inches thick long wooden planks are used for the construction of the hull. But when considering the boats, it should be 158 feet long & should have the capacity to hold about 100 men. I know most people have noticed the structure of a snake boat. Can you imagine how experts were the people who constructed those boats? These boats were constructed in a manner so that the head & tail will project 5 & 3 feet above the water level. There should be 64 seating compartments in each snake boat so that they can accommodate 64 oarsmen, who represent the 64 art forms. Again note that master oarsmen (representing 4 vedas) are seated at the head of the boat. They are provided with large oars so that they can control the direction of boats. I don't know whether you have noticed 8 people (representing ashtadikpalakas) standing in the middle of the boat. The wood from jackfruit trees are used for making snake boats. Another fact is that the outside of the boat is coated with animal fat boiled with lime but the inside is usually smeared with fish oil. Inorder to make the boat slippery in water, coconut shell carbon, eggs & fish oil are used. Remember that chundan vallams are treated as deity & only men are allowed to touch the boat with bare feet. Arrangements start days before the event (snake boat race). There will be pujas involved to Gods by a priest. This is done to get the blessings for the boat & the boatmen who participate in the event. This is a special dish to be prepared in the onam season. Read and try it out. Get Onam Song Lyrics of Maveli Nadu Vanidum Kalam. This is one of the songs tells about the good times of Kerala during the rule of Mahabali.